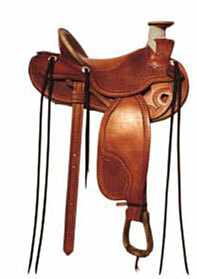 Horsemen and women know that a proper fitting saddle is as important to the horse as it is to the rider. And because were horsemen too, were particularly sensitive to making sure every custom made saddle we make sits right  whatever your riding style. Well help you every step of the way, from selecting the right tree style to the kind of stirrups you prefer. You can have personalized options you wont get with a factory-built saddle, and youll have a custom made saddle that you can pass on down to the next generation. All saddles are made with the finest Herman Oak™ leather for years of dependable service. Depending on how many orders are ahead of you, we can safely say your custom made saddle will be completed within 10 to 12 months from time of deposit. 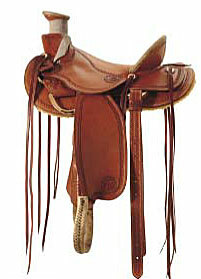 Made-to-match saddlebags, breast collars and headstalls also available. CALL 307.587.4130 or 307.899.0790 to visit about your options.